As I'm sure I've mentioned before, there are no Chaotic gods in the Dwimmermount campaign. For that matter, there are no Neutral ones either. All deities are Lawful, being strongly connected to human civilization (no other races have gods of their own, though some occasionally adopt human ones for various reasons). Now, "Lawful" does not equate to "Good." Quite a few of the gods couldn't be called "Good" by most moral standards, Typhon, protector of the city-state of Adamas, being a good example. This conception is derived in part from my reading of OD&D, which terms Chaotic/Evil clerics as "anti-clerics" and denies them both healing/restorative magic and the ability to turn the undead. The use of the prefix "anti-" in this context is suggestive and is almost certainly the model for the later "anti-paladin," a coinage that remains current to this day, while few talk of anti-clerics anymore. Given the pseudo-Christian trappings of the OD&D cleric, I tend to conceive of anti-clerics after the fashion of 60s and (especially) 70s pop cultural Satanism -- a vast conspiracy in thrall to otherworldly evil and attempting to subvert the natural order from behind scenes. That's why anti-clerics in the Dwimmermount campaign serve not gods but demon lords and princes. It always bugged me that, in AD&D, it wasn't technically possible to be a cleric of an archdevil or demon prince, since they weren't "gods" according to the rules set forth in Deities & Demigods (someone can correct me if I'm misremembering this). To me, the lords of the Nine Hells and the Abyss were far more interesting as potential patrons to evil clerical types than to the evil gods I encountered in almost every fantasy setting. That's why, in my old campaigns, I came up with the idea that all demon/devil worshiping clerics were secret ones, ostensibly serving a "real" god and siphoning the power to cast spells from him, said secret being maintained through a dark blessing that cloaked their true alignment and allegiance. In OD&D, there's no need to worry about such matters, because there's thankfully no know alignment spell, which I consider one of the most damaging additions to the game and a prime mover in the shifting presentation of alignment in Dungeons & Dragons. Likewise, the deities of Dwimmermount aren't personally active, a fact demons use to their great advantage. So, if the high priestess of Tyche is secretly an anti-cleric dedicated to the demon lord Tsath-Dagon -- note to my players: she's not -- you won't be able to determine this simply by checking her alignment through magic. Granted, in such a case, the high priestess wouldn't be able to cast cure light wounds or raise dead, but that's easily worked around. She has underlings, after all, and there are always scrolls. Consequently, demon cults in the Dwimmermount campaign operate in the shadows, infiltrating and subverting existing temples and other power blocs. There's no formal coordination between them, as the demon lords and princes all have their own schemes and, even when they complement one another, they rarely have interests in cooperating with others of their kind. For that matter, two cells devoted to the same demon lord may work at cross purposes; that's just the nature of Chaos and an important reason why Law has not yet been overthrown. Despite its power and willingness to use it without remorse, Chaos is, well, chaotic and that limits its effectiveness. Of course, there are lots of demon cults, so, what they lack in organization, they more than make up for in numbers and zeal. "It always bugged me that, in AD&D, it wasn't technically possible to be a cleric of an archdevil or demon prince, since they weren't "gods" according to the rules set forth in Deities & Demigods (someone can correct me if I'm misremembering this)." They are gods. See DDG p. 105 (start of the "Nonhumans' Deities" section). What bugs me is the whole "divine connection", to have power that is so strictly tied to the gods (to the extent that if you don't follow your god you lose that power) is bad in general IMO, I would much prefer a less explained power source. It's ok if you have a different spell selection, but I would leave very undefined the source of your power (psychic, magic, demons, devils, gods, ki.... who cares?). I would just add ritualistic/cerimonial magic connected to the various cults (such rites would be time-consuming, expensive and for evil cult also very evil... just nobody is sure of the source of the powers. I wonder why I recalled that the DDG denied archdevils/demon lords clerics. Isn't there some kind of qualifier in that book about the extent of their powers or something? Are you sure you're not thinking of a 2E or 3E rule? The DDG p. 105 reference says, "The following beings from the Monster Manual and Fiend Folio should be treated as lesser gods, though they very rarely have human worshippers: Monster Manual, Demon: Demogorgon, Juiblex, Orcus, [etc.]" The "lesser gods" status does imply they can't grant 7th-level spells. IIRC, Gygax's original Greyhawk folio specifies that the Horned Society is ruled by a council of devil-worshipping clerics, for example. For some reason I always thought the demon lords and devils were considered demi-gods for the purposes of granting spells (5th level max). But right now I can't seem to find the text that led me to believe that. "Only the greater gods may grant 7th level spells." So as Delta pointed out, they are considered lesser gods, and wouldn't be able to grant 7th level spells btb. Personally I always ignored this. Is that photo from The Devil's Rain (1975)? Because I just watched that for the first time last night. "I tend to conceive of anti-clerics after the fashion of 60s and (especially) 70s pop cultural Satanism -- a vast conspiracy in thrall to otherworldly evil and attempting to subvert the natural order from behind scenes." Yep :) For me, this is actually a big part of the 'vibe' of old DnD. It doesn't really have anything to do with the church, as I didn't go to church as a kid in the '70s. It's the hinted-at mysterious bad guys and enemies thing. It was in the news, but you had a sense they weren't saying everything, and that even if they did, they only knew a tiny bit of what was actually going on. I always go back to the movie Spectre, with Robert Culp, as one of the best examples of this. I think this idea of mystery and the unknown in the enemies your characters are fighting is very important. The concept of unknown details, in the rules as well, is, I think, really central to achieving the old-school feel. Law represents the divine order - good or evil is irrelevant. Evil deities are lawful. Fallen angels (ie, Devils) are lawful. If it's related the celesial spheres, it's lawful. Chaos represents those things we attribute to it... the Courts of Chaos, the forces of the Abyss, the howling demons and their Princes. I'm glad to put the OD&D anti-cleric in this lot. I've read Zelazny and Moorcock but have been trying to track down a copy of Three Hearts and Three Lions. Yoinked! I like the idea that anti-clerics could still have access to the unreversed spells, albeit the unreversed versions end up a bit 'tainted'. Visons of Pet Semmtary raise dead and so on. What you need to do is create a "False alignment" or "hide alignment" spell of higher level than know alignment so the evil ones can carry out their nefarious plans. Lemmie hear ya say Muahahahha! It's a very nice use of the anti-cleric and adds a lot of intrigue into cleric organizations, it has overtones with heresies of the Catholic church where random groups of priests and nuns would worship or interpret the bible as they saw fit. There's even accounts of ogries by these groups that the Catholic churched purged by fire...literally. It also gives a nod to Keep on the Borderlands, where the cleric of the village is actually and secretly evil (chaotic). Personally though, I prefer the dichotomy between wizards and clerics and would prefer my anti-clerics just to be demonologist magic-users. But yours has style! "Law represents the divine order - good or evil is irrelevant. Evil deities are lawful. Fallen angels (ie, Devils) are lawful. If it's related the celesial spheres, it's lawful." Originally, demons were servants of the gods and they acted on orders from higher up (lawful evil), punishing and inflicting pain on mortals, with the exceptions of Lamashtu, an earlier version of Lilith, who acted of her own accord (chaotic evil); she is the daughter of Anu (lawful neutral in DDG), and is referred to as a "daughter of Heaven". The contrast between good and evil seems to first appear in Persian Dualism. Later on in Christianity demons are no longer servants of Heaven, hence Satan is a "fallen angel". If my PC ever meets a "cleric" that looks like Tom Skerritt in a bad toupee, I'll just assume he is an evil cultist. Spotting the bad guys should involve more than a spell, rather, something juicy like a secret mark or gruesome remains beneath floorboards. "Personally though, I prefer the dichotomy between wizards and clerics and would prefer my anti-clerics just to be demonologist magic-users." That's my approach as well: demons and devils can't (or don't) grant spells in the same way deities do and so don't have clerics; demons and devils grant wishes or hand out sinister magic items in exchange for souls. So their spell using followers are indeed magic users a la Doctor Faustus or the medieval view of witches. However, the "anti-cleric" approach sounds cool as well. Love the nod to Kolchak there, James! It's certainly possible, though just why I should be I can't say. My memory has played odder tricks on me before, so who knows? Thanks for the correction, as ever. Is that photo from The Devil's Rain (1975)? No, although the timeframe is almost identical. 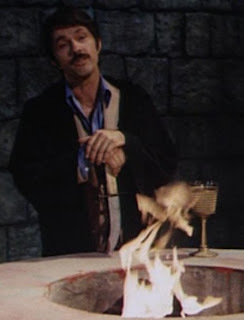 It's from an episode of Kolchak: The Night Stalker called "The Devil's Platform" in which Tom Skerritt plays a political candidate who's sold his soul to the Devil. Yep :) For me, this is actually a big part of the 'vibe' of old DnD. Very much so. D&D has a "whiff of brimstone" about it well into the early 80s and it's something I consider an important feature of the days before it went mainstream and began the process of Bowlderization. Oh, and obviously you have the 1E example of the demoness Lolth (one of mentionees on DDG p. 105). In GDQ she has bunches of clerics running around with full powers; including possibly human ones (Q1 Appendix, Level 2, expansion room #19: "TEMPLE OF CHAOTIC EVIL. Lolth's favorite human cleric and 6 lesser human clerics reside here..."). Lareth the Beautiful (the bad guy in The Village of Hommlett) was also a cleric of Lolth. The wrangling over evil cleric/anti-cleric is a distinction without a difference, just as the hair-splitting over gods, demi-gods, demons etc.